Laure Genillard Gallery is delighted to celebrate twenty-one years of continuous programming with a new performance and exhibition by JocJonJosch. Foot-Kroku-Zvuk-Klingen-Fall - the corruption of ‘footfall’ through translation from English, to Czech, to German places an emphasis on the motion and the sound of the action implied by the word Footfall. The collective JocJonJosch are devising a new performance entitled Footfall premiering at Laure Genillard Gallery on the opening night, lending its name to the exhibition and thus defining its parameters Footfall. The exhibition is curated by Jo Melvin. JocJonJosch is the European collaborative practice of three artists; Jonathan Brantschen, Joschi Herczeg and Jocelyn Marchington, based in Switzerland and England. Together they explore the difficulties and joys inherent in group and individual decision-making processes. Their seemingly repetitive and futile interactions slip between notions of humour, pain and the serio-comic. Imagist constructions in poetry function similarly to the transience associated with a footfall. The word acts on our sensibilities to conjure with imaginative associations in subversive, straightforward and unexpected ways. We seek parallels. This process points out how memory operates, through sensory association, a touch of the hand, an aroma or a smell: when particularities can vaunt and compress time’s duration. The activity of digging has formed a core part of the production of JocJonJosch’s work. This is the repetitive motion and the physical act of digging, making a hole and piling the soil. 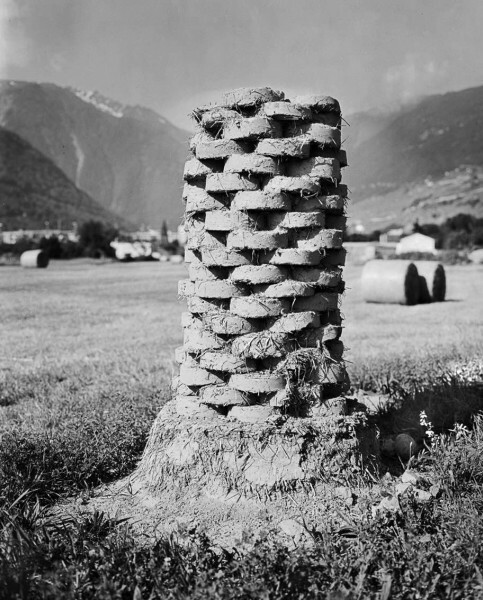 Questions of what to do with the displaced earth and where to put it are confronted; use it to re-fill the hole, or to make bricks which form a tower of mud. The hole in the ground indicates a kind of memorial while the tower is an inevitably disintegrating edifice.